My contribution for July 3, 2103 to the Daily Photo Game. Looking at Bob’s window without a view, I began my process, making a list of words that I perceived from the shot. Texture, wall, window, 100, monochromatic and several more. 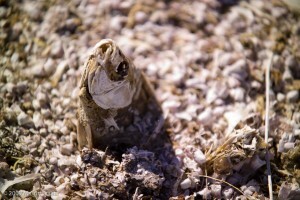 While writing, I was reminded of an adventure out to the Salton Sea that included decaying trailers and the many dried fish on the shoreline. Picked this shot, since he was looking for his last breath, and no where to go, truly a dead end. Posted: March 6th, 2014 under Daily Photo Game.